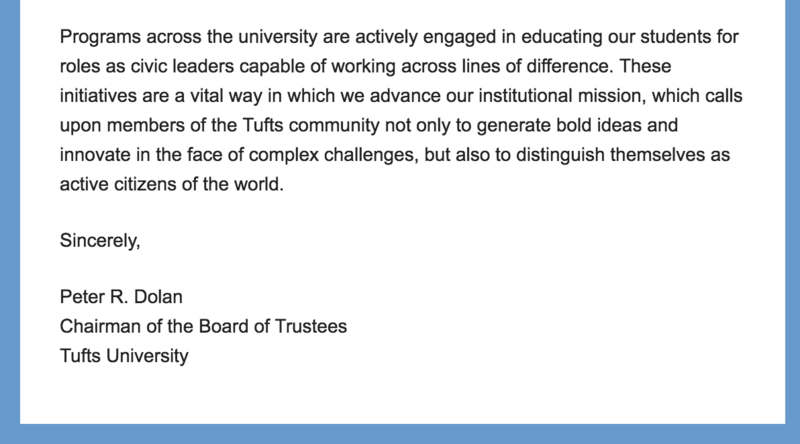 The email sent by Tufts. A day before Passover, the Tufts Student Government passed a resolution in support of the laughable BDS movement that targets Israel and ignores every country in the world with actual human rights abuses. The student government passed the resolution at its last meeting of the year, so there was no chance for students to appeal it. This is not the first time that anti-Israel activists have brought up BDS resolutions when Jewish students were the least likely to be on campus. Three years ago, anti-Israel activists planned on bringing a BDS resolution to their student government during Passover, but ultimately backed down after international condemnation. Fortunately, adults are in charge at Tufts. 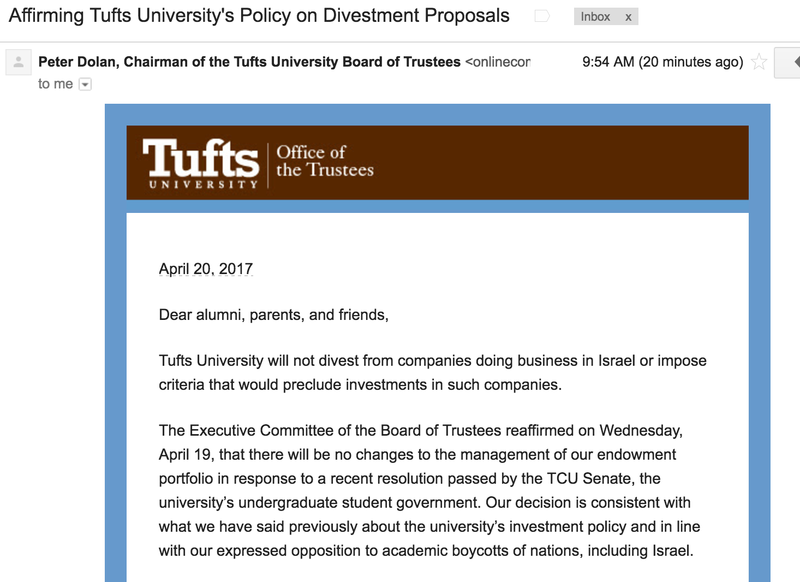 Tufts University will not divest from companies doing business in Israel or impose criteria that would preclude investments in such companies. The Executive Committee of the Board of Trustees reaffirmed on Wednesday, April 19, that there will be no changes to the management of our endowment portfolio in response to a recent resolution passed by the TCU Senate, the university’s undergraduate student government. Our decision is consistent with what we have said previously about the university’s investment policy and in line with our expressed opposition to academic boycotts of nations, including Israel. There is a wide diversity of opinion in our community about these and many geopolitical issues. Tufts University must remain an incubator of ideas, knowledge, and perspectives that supports our students as they challenge their own assumptions, test their hypotheses, and think critically about the world. 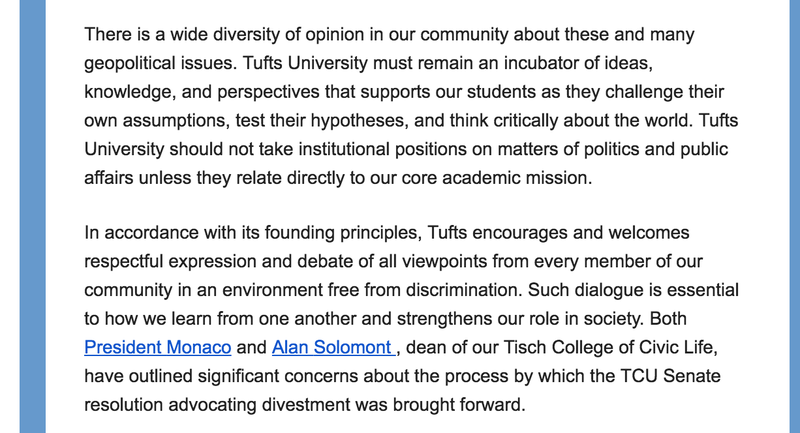 Tufts University should not take institutional positions on matters of politics and public affairs unless they relate directly to our core academic mission. In accordance with its founding principles, Tufts encourages and welcomes respectful expression and debate of all viewpoints from every member of our community in an environment free from discrimination. Such dialogue is essential to how we learn from one another and strengthens our role in society. Both President Monaco and Alan Solomont , dean of our Tisch College of Civic Life, have outlined significant concerns about the process by which the TCU Senate resolution advocating divestment was brought forward. Programs across the university are actively engaged in educating our students for roles as civic leaders capable of working across lines of difference. These initiatives are a vital way in which we advance our institutional mission, which calls upon members of the Tufts community not only to generate bold ideas and innovate in the face of complex challenges, but also to distinguish themselves as active citizens of the world.